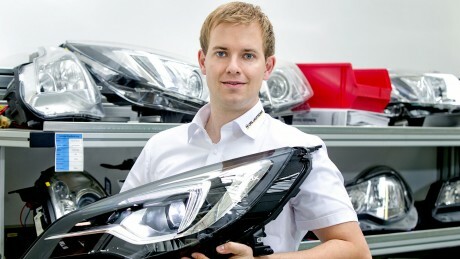 Frank Langkabel with the new matrix IntelliLux LED light. Frank Langkabel, Project Engineer Lighting Technology, on the new matrix IntelliLux LED light, the first reactions from media representatives, and the ideals of an Opel lighting technician. Mr. Langkabel, you were at the validation drives when representatives from the media got to experience the new Astra. How did they react to the new LED matrix light? They were very enthusiastic, there’s no other way to put it. The night drive was the real highlight. We had an Astra with matrix lights drive behind a second Astra driving without any lights on. The first driver still had good visibility, as the light bulb of the rear Astra kind of twisted around his vehicle. It’s a funny way to clarify the principle: The matrix light can literally shield obstacles by independently deactivating one or several of its 16 elements. 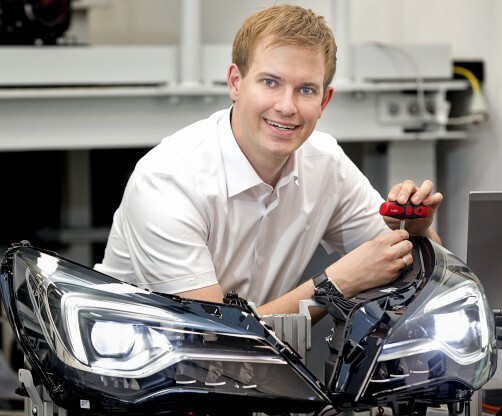 What do you think is the most important function of the new light? The new lighting system marks the end of switching between low and high beams. It works together with the integrated front camera to detect whether or not the Astra is driving in a built-up area and if so, it independently adjusts its light beam accordingly. By the way, you don’t need to have a navigation system for this to work. The driver no longer has to switch back and forth between low and high beams. The system regulates the transitions smoothly and fully automatically, right through to a special highway light mode. The bottom line is: It’s no longer possible to blind oncoming vehicles or people in front in the rear-view mirror. Apart from all of that, is it more efficient? Light technology is developing rapidly. It was just seven years ago that Opel presented Bi-Xenon headlights with adaptive curve lighting in the Astra. At that time, many people thought it couldn’t get any better, particularly in the compact class. But now we’re seeing another giant leap forward. Is there an ideal that you’re working toward? Yes, of course. We want to turn night into day. By that I mean that the driver should be able to see just as well at night as during the day. Our matrix LED light has allowed us to make good progress. Today’s Xenon systems allow the driver to see around 140 meters ahead with full high beams and about 80 meters using low beams. The new LED matrix light now allows the driver to always see 140 meters ahead outside of built-up areas, as there are no longer low beams in the proper sense. The driver can now also see objects at the edge of the highway 30 to 40 meters sooner. That amounts 1.5 seconds earlier if you’re traveling at a speed of 80 km/h. That’s a lot of time, particularly if you have to react to wildlife running onto the road. Despite all of that, you’re working on the next big development: eye tracking light. Tell us more. Put simply, we use a camera to track the eye movements of the driver and focus the light for him in the way that his eyes tell us. Believe me, we’re closer to a production-ready solution than you might think. And why wouldn’t we be? Opel has always striven to read drivers’ minds when it comes to what they want. Who says you need skis for alpine snow fun?